Sebastian Vettel says losing the world championship to Lewis Hamilton was “a horrible moment” but has praised the Briton as the better performer in 2018. Hamilton finished fourth behind second-placed Vettel at the Mexican Grand Prix to beat the German to a fifth world championship with two rounds remaining. The title was set up to be a nailbiter early in the season, with the advantage waxing and waning between Ferrari and Mercedes, but Hamilton snuffed out any realistic hope of the silverware returning to Maranello with a run of six wins in seven races between the German and Japanese grands prix. Hamilton’s championship triumph has therefore been an inevitability for close to a month, but Vettel said the defeat was no less difficult to stomach when it eventually arrived in Mexico. “It’s a horrible moment,” he said. “You put a lot of work … you try to hang in there as long as you can. “I have had it three times now in my life, but there is still disappointment on the day you realise you can’t win the championship anymore. “Those are not happy days and you have to reflect not on one moment but the whole year of work and effort that goes in, from the end of last year until now. Though Vettel admitted that in some respects he had found the 2018 season amongst his most difficult, the fact Ferrari had the fastest car for much of the season focuses the spotlight back on the driver errors and botched upgrades that ultimately led to Hamilton acquiring his insurmountable points lead. “It was definitely different to other years, but nevertheless we shouldn’t neglect the fact that we had a very strong package and we were able to win races,” he said. But Vettel conceded that he was beaten by the more polished driver. 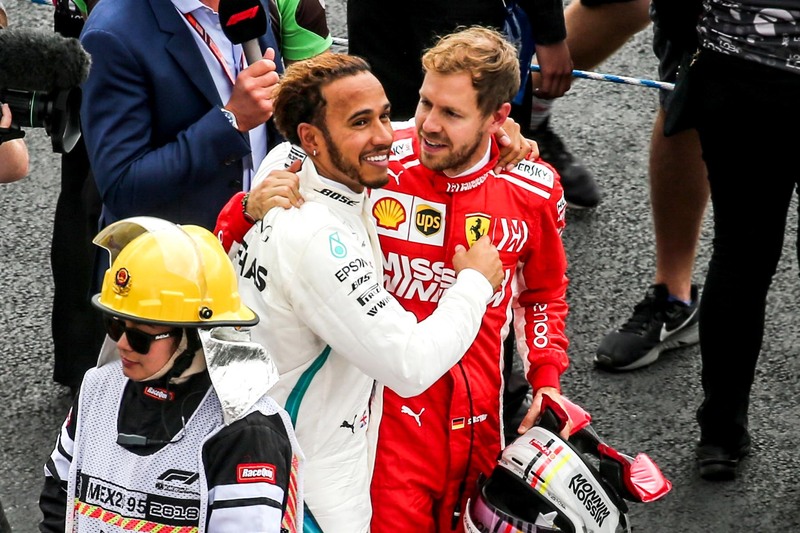 He took the time to congratulate Hamilton on his victory after the race, and television cameras found him congratulating Mercedes engineers in a great show of sportsmanship. “I congratulated him and I think he drove superb all year,” he said. “It was going to be one of us two, so I told him it was well deserved and to enjoy it. I told him number five is something incredible. Hamilton said he appreciated the gesture and paid tribute to his rival. “Ultimately it was a true showing of great sportsmanship and respect between us, as I think there has been all year long,” he said. “I think that’s great to have in multiple world championship, two competitors who have gone head to head. “He is a deserving four-time world champion, and this year the pressure that he would be under at Ferrari, who have not won a championship for many, many years — that’s a lot to ride on one’s shoulders. “I think this year, even though he’s had some difficult times, he’s still bounced back, just like today. That’s the true showing of a champion.